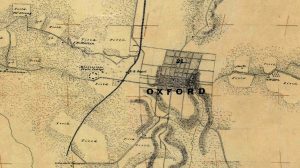 This map of Oxford from 1862, along with many other maps of north Mississippi, is available for online access. Members of the UM Slavery Research Group will demonstrate how to access these maps Nov. 13 at the Burns-Belfry Museum and Multicultural Center. OXFORD, Miss. – A partnership between the University of Mississippi Slavery Research Group and the Oxford-Lafayette County Heritage Foundation and has resulted in a new online resource that will make historic maps of Oxford and Lafayette County available to the public. An unveiling of the online maps will be presented at the heritage foundation’s annual meeting at 5:30 p.m. Monday (Nov. 13) at the Burns-Belfry Museum and Multicultural Center. The session is free and open to the public. The Slavery Research Group has partnered with heritage foundation, the UM Center for Archaeological Research, the city of Oxford and the UM Geoinformatics Center to form the Historic Maps Project. The group has discovered and pulled together maps of Oxford and Lafayette County dating from 1835 to the present, including Civil War-era and early 20th century maps. “Some of these maps were only recently discovered and made available to us, so we are excited about sharing these with the broader university and Oxford-Lafayette communities,” said Jeffrey Jackson, associate professor of sociology and co-chair of the Slavery Research Group. The project involves the digitization and online display of these maps, which are aligned and layered onto each other so they can be used for research purposes to better understand the area and its history. The group plans to add more maps and historical information in the future, and the LOU community is invited to help add material to the online resource. The maps are housed on the Burns-Belfry website, and a tutorial detailing how to navigate the site will be conducted at the meeting. For more information, visit http://www.burns-belfry.com/.